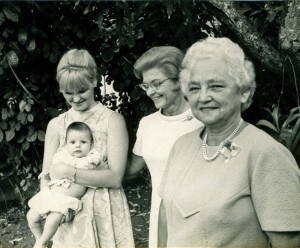 Myself (baby), my mother, grandmother and great-grandmother. They may be called any combination of names — Grams, Gamoo, Nana, Granny, Grandma, Grandmother, Pop-Pop, Grandpa, Granddaddy, Grandfather — the list is endless — but grandparents play a special role in children’s lives. Sometimes that role can be a bit challenging to the parents, as you can see in the latest video by Juice Box Jungle — which now shows in the ad space in my sidebar on the right — please check it out! I don’t face the challenges a lot of parents do because my children’s grandparents live far away, so we don’t have a lot of friction about breaking rules, etc. We’re so thrilled when the grandparents come to visit, that we’re able to deal with some rule-bending. Our kids are lucky enough to have great-grandmothers in addition to grandparents — something I treasure because I grew up knowing two great-grandmothers and a great-grandfather. The utter delight my children derive from their relationships with their grandparents thrills me. Even though my kids are still quite young (5 and 3), they really enjoy talking on the phone (using speaker phone) with them, using Skype, and receiving cards in the mail from them. Sometimes they will even receive photos in email from them, and they enjoy that. I’ll tell the kids we are taking pictures to put up on our family blog to show the grandparents, and then they will ham it up for them. It’s amazing how much easier it is for kids and grandparents to maintain a relationship over a long distance via technology than when I was a kid. While putting JavaBoy to bed one night, we got into a silly conversation one night, and I can’t even remember how it got started, but basically I said something along the lines of, “And when you have kids, I’ll be their grandma! And I’ll take them to the circus!” To which he replied, “Well, only if the parents say you can.” And I said, “Yep, I’m going to take them to the circus and give them popcorn, and cotton candy, and lemonade and all the candy they want!” And he looked at me with big eyes and said, “No! That’s not good for them. You won’t be a very good grandma if you do that!” I nearly busted out laughing! You see, on my very toughest parenting days, I keep telling myself, “I’m doing this so I can have grandchildren.” I very much look forward to being a grandparent and doing all the fun stuff and worrying less about the hardest parts of parenting — doing all the GRAND stuff without having to also be responsible for all the day-to-day upbringing. But for now, I’m glad my kids have a wonderful mixture of so many grandparents and great-grandparents in their life — ones who truly treasure them because I’ve heard so many horror stories of grandparents who don’t and I just can’t understand it. Because just as grandkids need grandparents, I think grandparents need grandkids, to help them remember what makes this world so exciting and wonderful — there’s nothing like looking at the world again through a child’s eyes.